Recently under which campaign initiated by Chief Minister Sh. Akhilesh Yadav did Uttar Pradesh state govt. earned itself a place in Guinness Book of Word Record? (b) Clean U.P. Green U.P. Answer:(b) Clean U.P. Green U.P. 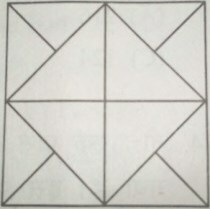 Given below are the four different positions of a dice. Which number will appear opposite to number 2?